This replacement mirror pair is just what you need to get your GM car in good looking form again! Please note: There are 2 mirrors offered by GM depending on the distance between mounting studs. One has 4 1/2" (117mm) mounting base and the other has 4 1/4" (110mm). The mirror we are selling is the 4 1/4" (110mm). The measurement is taken across the mounting surface of base (not applique), from the lower point on the straight edge to the longest distance across. This GM car mirror pair makes a great replacement and has substantial cost savings over dealer units. 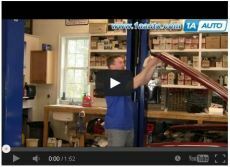 Watch the door panel removal video if you need assistance removing the door panel. It is attached as a video response below. Remove the insulation to access the mirror bolts. Remove the three 10mm nuts from the mirror. Pull the mirror up and off. Use the door panel video for assistance on this.